I’ve been following the plight of the honey bee for years now. But with me recent plunge into the whole apiary business, I’m much more interested. Back when I first started reading about the problem of hives dying off, Colony Collapse Disorder, the leading theory was that cell phones and cell phone towers were interrupting the ability of the bee to travel. They were getting lost and dying. Since then, theories abound. However, the most recent and loudest has to do with the whole issue surrounding GMO crops. Is it the pollen from the crops themselves that are killing the bees? Is it the herbicides and pesticides that can now be used with much more freedom that are killing the bees? WASHINGTON — The devastation of American honeybee colonies is the result of a complex stew of factors, including pesticides, parasites, poor nutrition and a lack of genetic diversity, according to a comprehensive federal study published on Thursday. The problems affect pollination of American agricultural products worth tens of billions of dollars a year. The report does not place more weight on one factor over another, and recommends a range of actions and further research. 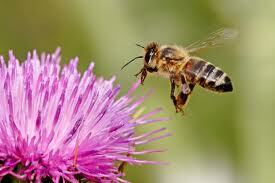 Honeybees are used to pollinate hundreds of crops, from almonds to strawberries to soybeans. Since 2006, millions of bees have been dying in a phenomenon known as colony collapse disorder. The cause or causes have been the subject of much study and speculation. The federal report appears the same week that European officials took steps toward banning a class of pesticides known as neonicotinoids, derived from nicotine, that they consider a critical factor in the mass deaths of bees there. But officials in the United States Department of Agriculture, the Environmental Protection Agency and others involved in the bee study said that there was not enough evidence to support a ban on one group of pesticides, and that the costs of such action might exceed the benefits. I’m happy with the approach. I like the idea of scientific study of causes and reactions. I also like it when those scientists admit that they don’t yet know and need more time. This entry was posted in Environment, Technology and tagged CCD, GMO, Honey Bees. Bookmark the permalink.